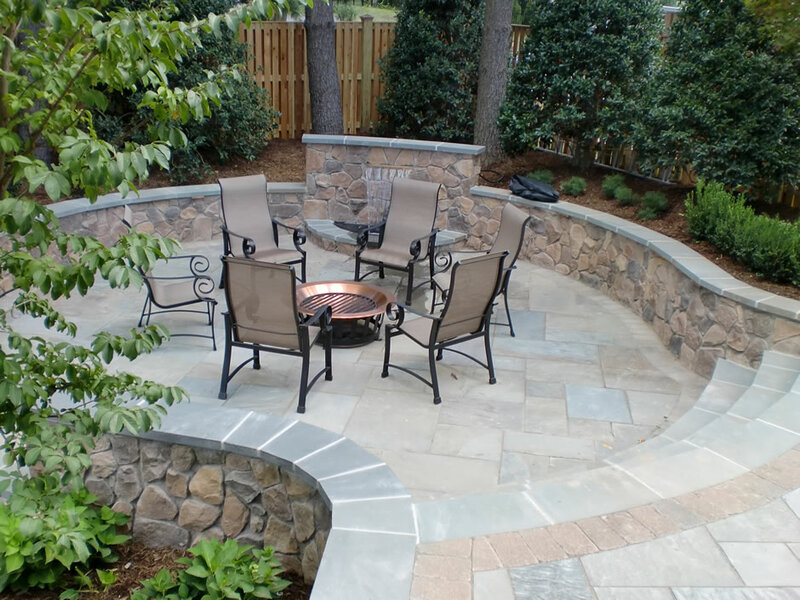 When planning your backyard patio, it is easy to get overwhelmed with the variety of styles, shapes and sizes patios come in. As professional designers, we have a simple process that we use that can help you when planning your space, or if you need help, please contact us for our professional landscape design services. The first thing to consider is the purpose of your patio space. Do you plan on entertaining friends and family? If so, how many people and what would you be doing? Patio space planning starts with the patio furniture. Consider how many people you would be entertaining and then figure out the appropriate patio furniture for this. If you want a space to relax, only a couple of lounge chairs and a side table may be necessary. If you want to cook out and entertain, you will likely need a table and chairs. 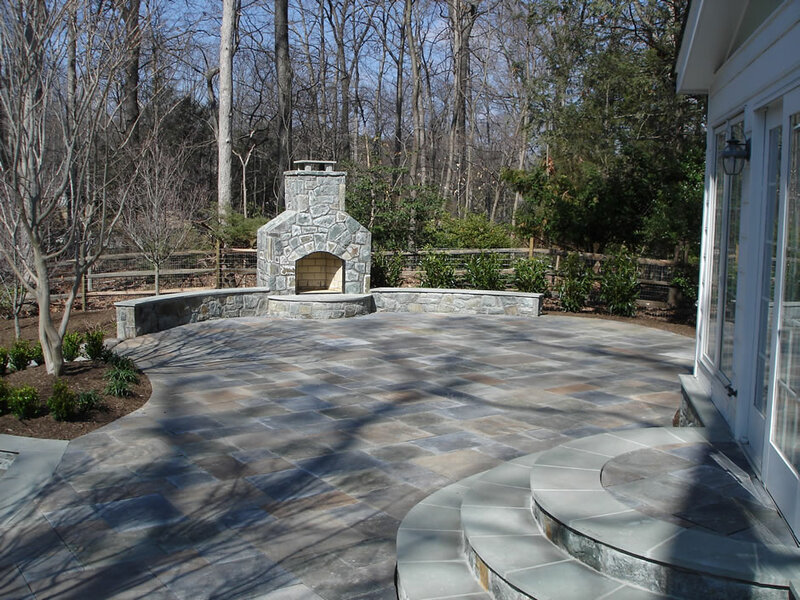 Most often, a patio has a primary and secondary function. The primary function may be a large dining area to accommodate guests, with the secondary function being a place to relax during the week with your family. 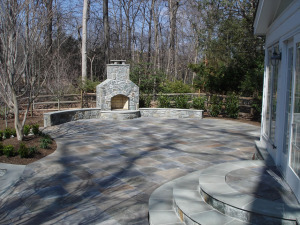 The location of your patio areas is extremely important. Consider what is the optimal place these areas should be, accounting for flow from inside the house as well as your sight lines from the space. An entertaining/dining area should be easily accessible from inside the home, with as few of steps as possible to get there. If you are planning on incorporating an outdoor kitchen, it should be easily accessible from your kitchen inside. A secondary patio area meant for relaxing can be more of a destination, further away from the house. 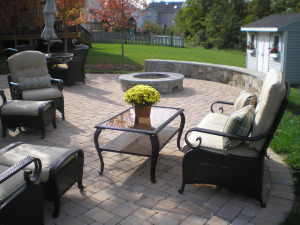 Views are also extremely important when determining the location of your backyard patio areas. Are your neighbors houses close to your property line? Are there any undesireable views you want to block or avoid? Finding the best spots are key. People often underestimate the size of the patio that they need. Once function and location has been determined, you need to consider egress- how people will move around the space. Once this is taken into consideration, you will have a general idea of the size of the patio that you need. Leave 3’-4’ around patio furniture (with the chairs pushed in) to allow for people to be able to move comfortably around your patio. The main entry to your patio, for example the kitchen door, should also account for egress. This would be considered a greeting area and it is a good idea to allow for space here as well. Imagine people gathered on your patio for a cookout, people will naturally congregate at these greeting areas. Leave yourself at least a 5’x5’ space to allow three adults to have a conversation comfortably. Any time you have level changes in your patio, you will also want to allow for a buffer, both on the top of the steps and at the bottom for safety concerns. Leave yourself a 3’x’3 landing at the top of a level change and the bottom. For the most part, there are three types of design styles to consider once you have determined the size and location of your patio. They are rectilinear, organic, and combined. A rectilinear patio shape is going to be perpendicular and parallel to your home with 90 degree angles. An organic shaped patio is going to be full of free flowing curves. 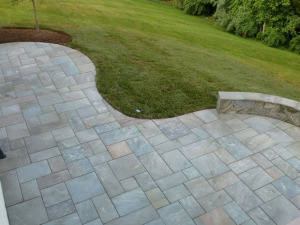 A combined type patio shape incorporates both straight lines and curved lines. Aside from preference, there is really no right and wrong style of patio to choose. To help you visualize the patio space you have planned, you can drag any patio furniture that you may already have into the space and set it up. Use a garden hose or spray paint to layout the bedlines.